Posh players with gifts for children at the City Hospital are from the left Michael Smith, Marcus Maddison and Aaron Mclean. Now they plan to give the fans a Christmas present as well. Manager Darren Ferguson’s Christmas present for the Peterboroguh United fans will be a top six spot in League One. 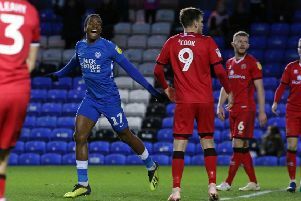 That’s the target for Posh as they approach festive fixtures at Chesterfield (Boxing Day) and at home to Doncaster (December 28). Posh are currently ninth in League One, but just a point outside the play-off places. “The Christmas games are important every season,” Ferguson stated. “But they are vital for us this year. “League tables can change very quickly as games come thick and fast. “There are only two matches this season, but if we win them, everything will look a lot rosier for everyone at the club. “They can be a springboard for a better run of results and that’s what we are aiming for. “We will take a lot of fans to Chesterfield and if they give us the same level of support that they did at Leyton Orient in the last away game we might well give them the same result. “We are all in this together and there have been signs in recent games that our form is returning. “We have two tough games though. I like Chesterfield a lot. I like the way they play and I watched them win at MK Dons in the FA Cup when they were excellent.